This blank card features the elegant Wallace Collection and is the perfect gift for anyone who loves London architecture. The Wallace Collection is an art collection in London open to the public, housed at Hertford House in Manchester Square, the former townhouse of the Seymour family, Marquesses of Hertford. This blank card features the elegant Brockwell Lido in Herne Hill and is the perfect gift for anyone who loves London architecture. 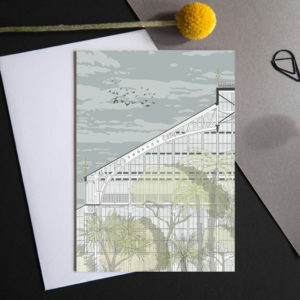 This blank card features the iconic Wembley Tower (now demolished) and is the perfect gift for anyone who loves London architecture. The original Wembley Stadium was a football stadium in Wembley Park, London, which stood on the same site now occupied by its successor, the new Wembley Stadium. The demolition in 2003 of its famous Twin Towers upset many people worldwide. This blank card features the London Transport Museum and is the perfect gift for anyone who loves London architecture. 2 Willow Road is part of a terrace of three houses in Hampstead, London designed by architect Ernő Goldfinger and completed in 1939. Goldfinger himself lived there with his wife Ursula and their children until his death in 1987 in flat 2. It has been managed by the National Trust since 1995 and flat 2 is open to the public between March and September. Goldfinger designed much of the furniture in No. 2, and the house also contains a significant collection of 20th-century art by Bridget Riley, Marcel Duchamp, Henry Moore and Max Ernst.